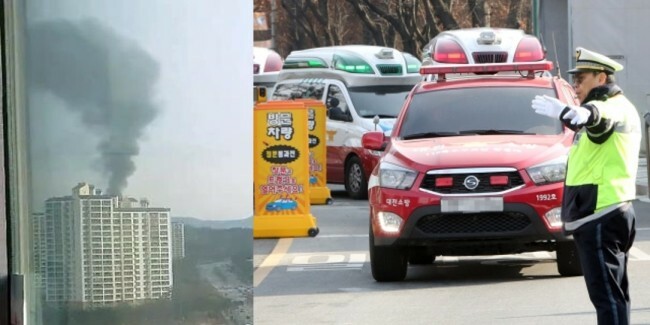 The deaths of three employees in an explosion at a Hanwha factory on Thursday have fueled concerns about workplace safety at the major Korean conglomerate, as an explosion at the same factory had claimed the lives of five people just seven months ago. Hanwha confirmed Thursday three employees had died after the explosion at its plant in Daejeon, a city some 140 kilometers south of Seoul. “We express our deep condolences to the victims and their families. We will do our best to address the accident and identify the cause with an on-site response team,” an official said. The explosion occurred at 8:42 a.m. Thursday at a Hanwha factory that assembles rocket propellants. Two of the casualties are believed to have worked at assembly lines while the other worked for qualification inspection. In May last year, the same factory reported an explosion that killed two people on site and severely injured three other employees, who later died during treatment at a hospital. Firefighters are investigating the exact cause of the latest incident, though they believe that Thursday’s explosion is similar to last year’s accident as both are related to rocket propulsion fuel. Last year’s explosion occurred while the employees were charging solid fuel in rocket propellant containers. Firefighters believe the recent explosion took place during the process of taking out fuel from rocket propellant containers. The plant involved in Thursday’s incident is one of four plants of Hanwha’s defense business. The firm has run the production facilities since it acquired them from the state-run Agency for Defense Development in 1987. Due to strict security, it is not well-known what is specifically produced at the plants, which are off-limits to general employees for security reasons. Hanwha jumped into the defense business in 1974 with its gunpowder technologies. It is now expanding into guided weapons, ammunition and the space business.